Description: finally a break in the rain an clouds. 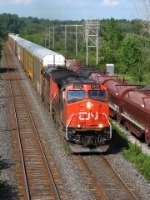 Title: CN 2602 at Mile 55 Dundas Sub. Description: Southbound autoracks. 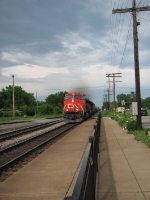 This is the third train of empty autoracks to pass through Pontiac in an afternoon. Title: Sunny Noon at Homewood. Description: These 2 Southbound CN freights were sitting in the plant at Homewood. Description: Canadian National 2620 passing St. Lambert VIA Rail station. Title: Deceiving shot, it's a rolling meet on the diamonds! Description: A CN westbound freight crosses the NS diamond at Stillwell on the Battle Creek Sub at MP-80. Title: CN 330 at Ingersoll. Title: CN 331 at Ingersoll. Description: CN 2602 leads an EB through a January snowstorm. Description: CN 309 accelerates west from Mallorytown Ontario and is about to pass under the new Hutcheson Road bridge.